Imagine how different your life would be if you knew a way to hack your daily habits to become a highly self-disciplined and productive person. 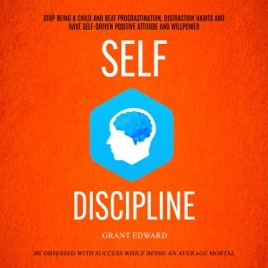 This audiobook contains proven steps and strategies on how to start leading a more successful life through improving self-discipline and confidence. In the modern day in which we live, we all want to be successful. Either we are working jobs that we don’t enjoy or we are wishing we would move on and better ourselves, or we need to lose weight, or achieve this, that, or the next thing. If you are suffering from not having self-control in your life, then you know what it is like to continually be disappointed with yourself. When you don't feel you have control over your decisions, your self-confidence also struggles. Also, each time you give in and lose willpower and make the wrong decision, you lose a little bit of yourself. After all, if a friend told you over and over again that he or she would do something but over and over again they didn't follow through with it, chances are you would stop believing them. This also applies to you every time you don't follow through with a decision or choice you tell yourself - you can't be trusted to reach your outcome! Obviously, this is not what we want. So, if you are ready to go all-in with proven strategies for self-discipline, then you will not want to miss out on listening to this audiobook. One of the things that could help you ultimately develop your self-discipline is to know that you can get something great out of it. Realizing its benefits before you begin in your journey is a good motivational factor that will help you stick to what you have started.